1 Secret Level In the first level, take the quickest route to the ext and get to the boss's room before the clock reaches 3:00. Then turn yourself into a mutant and beat the boos as quick as you can. When you beat the level, press START repeatedly. At the end of the dialog you'll see, "Stage X the strange level." Here you'll find two 1-Ups. your beloved Jennifer, who never escaped that place. "We can still save her," comes a voice from one side. released for the Turbo Grafix 16. I loved this game.. its action, fighting, and a cool main character.. and not that it matters.. but it has plenty of blood! This game was great. In the first level, you get the completely gratuitous lead pipe to beat the zombies with (you can kill them with one punch, but if you hit them with the pipe they splatter against the background wall!) and a boss wo looks like a zombie Jabba the Hutt! What more does a videogame need? Greqa grosume game full of action! 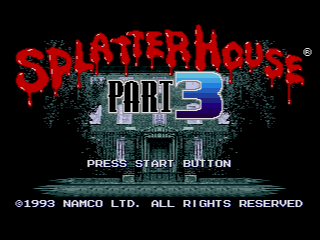 The Splatterhouse series is by far the greatest trio of video games in all of man's creation. The original was spectacular, and each sequel game was better than the last. I'll shorten this up for you: If you don't play these games, I'LL KILL YOU!!!!!!!! Este es el juego mas cochino de a historia!!!!! 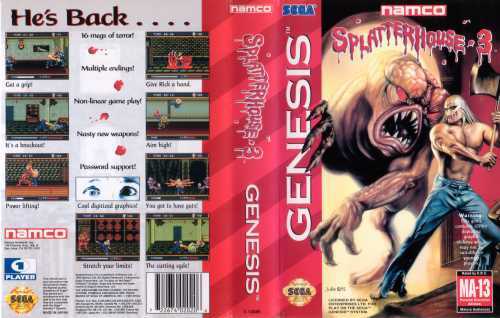 I think tht splatterhouse may be old fashioned but, it is very good for it being on the Sega. Sometmes i wish that the creators made it a little more difficult than it is for i am a master at any i find once i get use to the sega. 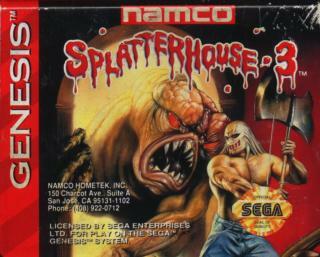 I wish that the splatterhouse series was more frightening because i love game that are well plotted lke splatterhouse. What like to see is me and some of my friends would like to be on this too because if i was in charge of the splatterhouse series i would have some great effects for it. Walkin' around with a Hockey-Mask, swinging pipes at the face of mutant mothafuckas, what could possibly be cooler than that? Easily 1 of the best games to hit the Megadrive! The 2nd 1 was a treat in itself changing the world of gameing (as did the 1st Splatterhouse), and then the 3rd instalment opened it up even more adding a little freedom and different endings depending on how you done during the game. As well as this a nice eray of new weapons are there to use, the meat cleaver is excellent! The first and original survival horror! Waaaay before Resident Evil! Infact, I can see alot of Splatterhouse in Resident evil, it just goes to show how much influence these games had on the industry. Still as strong as ever and getting stronger!!! 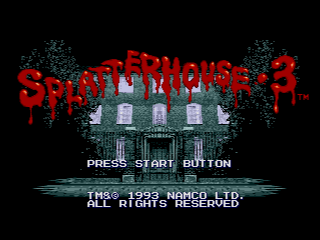 Which Splatterhouse game is scarier? 1 (arcade only),2 or 3? 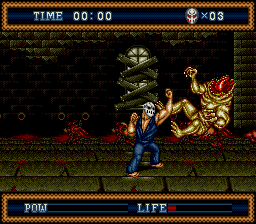 Apart from this series and the Mortal Kombat series, were ther any other gory sega megadrives games?